1 foil stamped area and four-color process printed on Side 1 of 14pt C1S White Semi-Gloss stock. Coated with Aqueous Gloss. H2 business card slits on left pocket. Professional Tax & Accounting's design emphasizes its logo's shape and colors. The purple band is shaped to resemble a hexagon, while the pocket brings purple's associations with class and creativity to the interior. Metallic Silver foil highlights part of the brand's name and the window, attracting recipients' gazes. On the back, a series of hexagons fades toward the top and grows darker at the bottom, pointing to the contact information. Side 1 printed with 1 PMS color using heavy coverage, 1 embossed area, and 1 debossed area. 100lb Charcoal Vellum stock (currently unavailable) uncoated. H1 business card slits and D1 disc slit on left pocket. Designed for AKP & Associates, this project uses multiple custom imprint methods to give the accounting firm's logo a one-of-a-kind look and feel. Metallic Silver foil glistens, reflecting light to attract attention. Raised embossed and indented debossed areas create a strong texture to help recipients establish sensory memories of the brand. Gray panels pair with the shiny silver for a sophisticated style. 2 PMS colors printed on Side 1 of uncoated 100lb Ash Linen stock (currently unavailable). H1 business card slits on left pocket. Blue accents on the cover of Katy LaBarbera's design establish a sense of professionalism and security, perfect for reassuring customers that their certified public accountant is trustworthy with their money. A cut-out window upholds this message of honesty by letting clients glimpse what's inside before even opening the front cover. 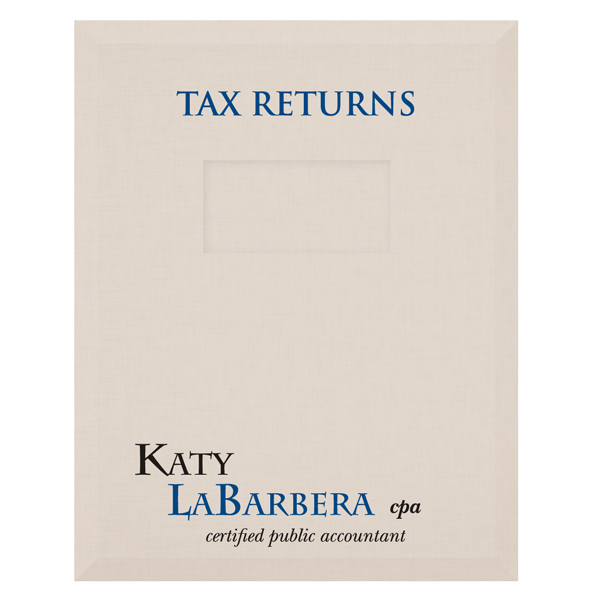 Besides giving clients a sneak peek of their tax returns, the window allows LaBarbera to insert a custom title page each year, making the design reusable across multiple tax seasons. The interior maximizes storage space with an expandable spine and fold-down tab, while business card slits on the left pocket make it easy for clients to access LaBarbera's contact information at any time. 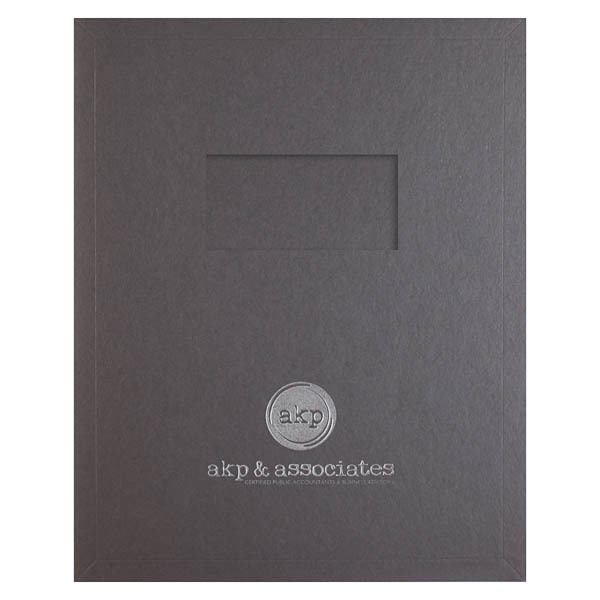 Aligning a custom title page with the 4" x 2" window makes this item reusable across multiple projects or business seasons, giving you a versatile and long-lasting design. A fold-down tab on the right panel lets you fasten papers to the product itself using standard metal prongs (sold separately). Folding the tab along the upper score line hides the prongs for a sleek interior, while leaving this score line unfolded allows you to fill the tab to its full capacity. The left pocket provides traditional storage that's familiar and reassuring. 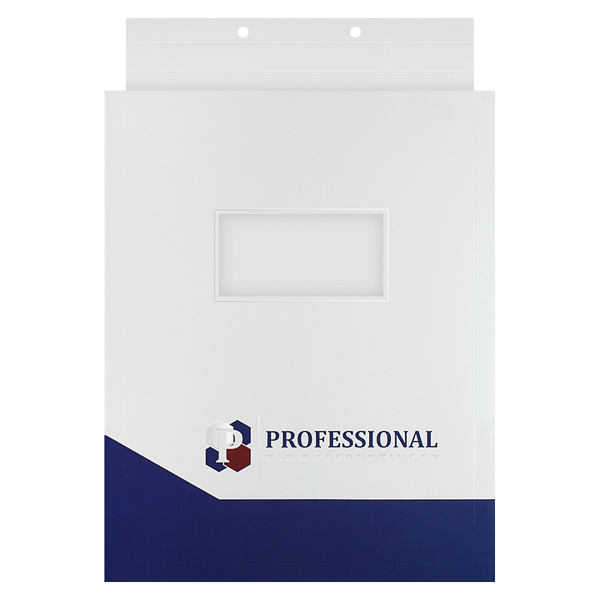 Expansion scores surrounding each panel allow the product to accommodate up to 3/4" thick stacks of 8 1/2" x 11" documents, perfect for large presentations or reports. Dimension Open: 19" x 13 13/16"